Bad news for the Muslim community in Geelong. The former Uniting Church was sold to become a mosque twenty-three years ago and there has been a harmonious relationship in our community across religious groups. Perhaps the arsonists didn't even know it was a mosque because it still looks like a Christian church in design. It's a shame for all of us. A SUSPICIOUS fire that destroyed a Geelong mosque is the fifth church fire in the city since last October. The bluestone building was fully alight when Country Fire Authority crews arrived about 2.10am this morning. The fire is being considered suspicious and is one of a number of church blazes in Geelong in recent months. Matt, who lives across the road from the mosque, told 3AW he heard a loud bang about 2.15am. “There was a loud bang, the sky was alight ... bright orange,” he said. The Imam, his wife and three children — who live at the mosque site — were evacuated. Mohammad Ramzan didn’t know what was happening when he was woken about 2am. “We thought it was a storm or the bin collection truck banging the bins,” he told 3AW. Mr Ramzan said the mosque hadn’t attracted any negative attention in the community. “In 23 years we did not have any trouble, rather we have compliments,” he said. He said the mosque would operate out of a hall at the site, which was unscathed in the fire. Inspector Graham Banks said the fire was one of a number of church blazes in Geelong in since October last year. “There’s been no acts of violence against people of Muslim faith (in Geelong),” he said. “They’re a harmonious community. This is a mosque where people of all backgrounds come to worship. Insp Banks said the Manifold Heights building was previously a church and not easily identifiable as a mosque. Police have stepped up patrols around churches in the region following a spate of fires. Churches in Norlane, Bannockburn and Geelong West have gone up in flames in recent months. Police are also in regular contact with Geelong’s interfaith community, providing safety advice. Arson chemists are waiting on the area to be secured before they investigate this morning. “It’s got to be made safe,” Insp Banks said. The site is the only mosque in the Geelong area. CFA duty officer Mark Sinkinson said the bluestone walls worked in the firefighter’s favour. “Our crews did a great job keeping (the fire) inside there, we did have the advantage of having those heavy bluestone walls to stop the spread of fire,” he told 3AW. Mr Sinkinson said only the walls remained at the mosque site. The building is the base for the Islamic Society of Geelong. Ambulance Victoria was called and remained on standby, but did not treat anyone. It took 35 to 40 firefighters about 50 minutes to bring the Manifold Heights fire under control. Seven trucks from Corio, Geelong West and Geelong City were called to the scene. The Bostock Ave bluestone building was formerly a church. CFA said it did not know how the fire started. Fire investigators and police will be on scene this morning to determine the cause. Police urged anyone with information to contact Crime Stoppers on 1800 333 000. I'm never happy when children's footie teams get put to the back of the queue and millions and millions are spent on spectator/professional football such as at the local stadium. The new admin man seems to be neglectful of the ordinary Saturday games played by chldren. THE Geelong Amateur, St ­Joseph’s and Grovedale footy clubs want to know why Geelong’s one-man council has undone plans for ratepayers to finance major works at their home grounds. The interim administrator, ­Yehudi Blacher, endorsed the City of Greater Geelong’s draft budget this week, revealing he had sidelined more than $3 million worth of projects that the elected councillors were planning to finance ­before they were booted from office last month. It’s believed Mr Blacher put about 10 projects on the backburner, including the three footy club requests, which added up to $950,000. Mr Blacher would not be drawn on which projects they were but said he had concerns about the processes councillors used to propose some of the projects and the business cases submitted for them. The City also said it had taken a more conservative forecast on some of the land sales that were planned to pay for the projects. “There were projects proposed by particular former councillors which hadn’t been through the normal assessment process,” he said. 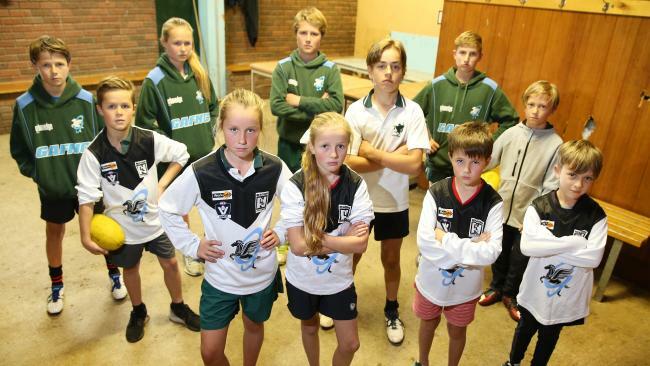 The frustrated footy clubs said they’d had no word from City Hall that anything was wrong with their applications, and — before the council’s dismissal — they had been informally told their projects were slated for financial backing in the budget. They now have until June 7 to persuade the City their projects were worthy of inclusion in this year’s budget. But it’s likely Mr Blacher will be gone by then, replaced by three administrators who will run the council until elections in October next year. The footy clubs have each said they needed new changerooms, particularly because of the growth of girls’ and junior footy, and they were not seeking cash for social amenities. Ammos was awarded $400,000 in last year’s council budget for its plan to rebuild the player changerooms on the lower level of its double storey Queens Park clubhouse. President Simon Farrell said the club was poised to start the project with cotenant Newtown Chilwell Cricket Club last year but it was ­delayed when council officers demanded a lift be included for disability access, at an estimated cost of $200,000. Joeys sought $400,000 to build stand-alone female changerooms at Drew Reserve for netballers, footballers and cricketers, who now prepare for their games in a public toilet block. “It’s disappointing — we ­believed our application ticked every box, and was submitted appropriately and in good faith,” club spokesman Ron Threlfall said. Grovedale facilities manager Neil Vivian said his club applied for $350,000 to build new visitors’ rooms at Burdoo Reserve, and planned a volunteer effort to rebuild its own changerooms. Mr Blacher said the projects he had decided against financing this year could still be given council funding in the future, but it was important the budget process have “integrity”. “They’re not dead projects, they’re still alive,” he said. Houses are now very very expensive so young couples can barely start off with a house in most suburbs in Geelong. We live in Boundary Rd - our side is Newcomb, across the road is East Geelong, and that is much more expensive than our side! This morning Ateca and I had a lovely morning tea with a near-neighbour Barbara then a walk around her prolific back garden with numerous fruit trees and vegetables. Two unusual trees (well, to me anyway) were the persimmon tree with an abundance of fruit, and a tamarella tree. I'd never seen either of them until about six years ago, don't remember any in Swan Hill. So here are some photos. The book Boodgery is a narrative on the impact of the first 40 years of European occupation upon the Aboriginal people in the Swan Hill area. 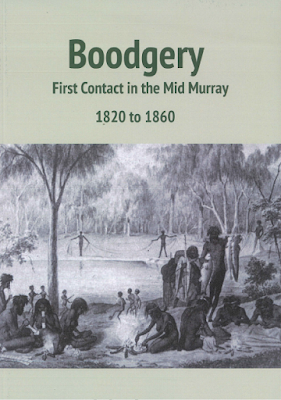 It is a detailed account of early contact and paints a picture of the colonial mindset of 'terra nullis',. misunderstandings, some hopeful meetings, some disasters. A very good read for anyone concerned about the damage that can occur with 'white' settlement. And about time too! Geelong High has plans for redevelopment so that's good news. We have two grandchildren going to Geelong High and also our three boys went there earlier on, and we lived in Shenton nearby - the manse now part of the school. plans for redevelopment and on photo showing water damage in library that happens from time to time. PORTABLES are out at Geelong High School, with garden views, a dance studio and airy atrium among the brand new facilities moving in for students to enjoy in coming years. 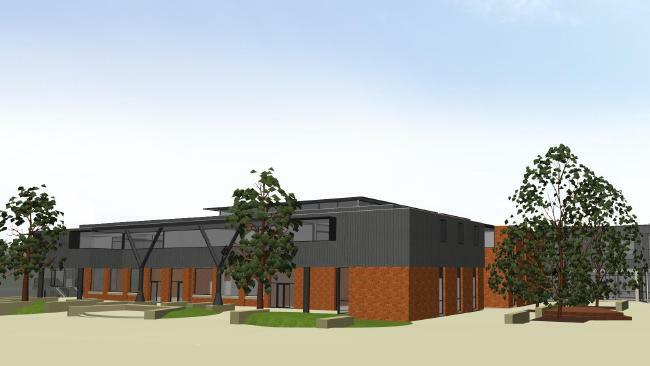 The 106-year-old school this week unveiled its plans for a $20.5 million facelift, which will see seven portable classrooms banished as part of a three-stage development spanning three years. Assistant principal Ken Stewart is leading the project and said works were long overdue after years of lobbying for government funding, which attracted bipartisan support in the lead-up to the 2014 state election. 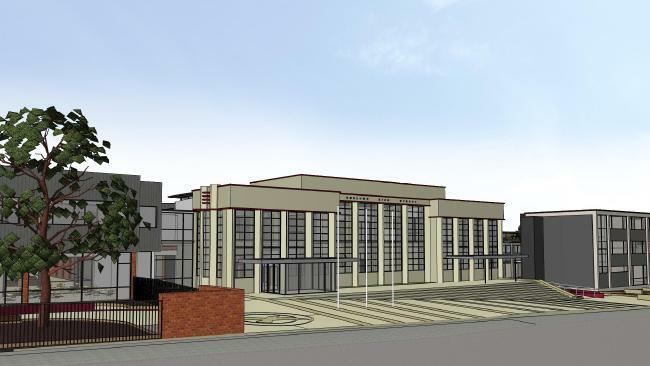 Geelong High School's $20m refurbishment will be carried out in three stages. “We’ve missed out a bit over the past 40 years in terms of funding grants — to have it all come together in one lot gives us the advantage of knowing we can complete the whole project in one go,” he said. Designed by award-winning architect firm McGlashan Everist, the project goes to tender on November, with construction to begin in February. As crumbling walls make way for a new building for year seven students, a new storey will also be added to the 100-year-old Kroger Building. Additional stages of the development include repurposing of the RJ Vague Building, with art rooms moved to the first level so students and teachers can take in views of Eastern Gardens. New VCE classrooms, a student lounge, cafeteria and wellbeing offices are also on the agenda, but the school has also been mindful of retaining its historic elements while bringing in new technology, Mr Stewart said. Daniel Andrews in the school’s neglected art room. 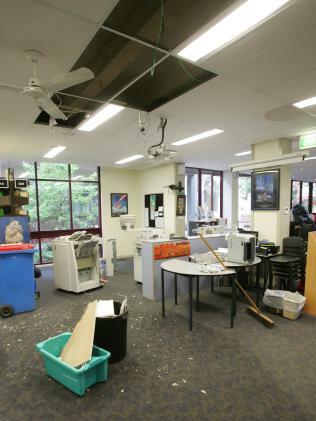 A previous incident of water damage inside the school library. “We have a very strong group of students interested in sustainability and will also begin applying for grants to meet the six-star energy rating,” he said. Previously described as “archaic” by Member for Corio Richard Marles, the school was ranked Geelong’s most run-down in 2011, with regular floods, asbestos, neglected ceilings and compromised disability access among its issues. School staff were also known for sandbagging buildings to prevent flash flooding after torrential rain. 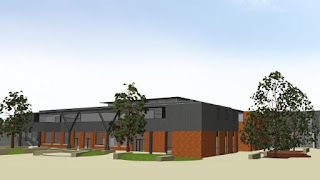 A community forum will be held at 6.30pm on Thursday, May 12 in the Geelong High School hall to discuss the school’s design and the thinking behind it. In the Addie: And he has a good reason. LACHLAN Philpott is an Australian playwright. He lives in Sydney and he writes great plays about Australia.His works often deal with young people, isolated people. His plays often document the joys and the difficulties of living in our country in this century. His plays have been produced in Australia and the United States. He is a Fulbright Scholar, a teacher and he grapples with complex ideas. His drama is filled with great comic characters. Philpott writes good jokes in his tragedies and this is why people like his plays. This week he wrote a provocative article and proposed a five-year ban on professional performances of the works of William Shakespeare. Fighting words in the cultural economy. But Philpott is right to suggest that it doesn’t take too many brain cells to program something that is low cost and high yield. In 2016 Australia, Shakespeare is programmed by professional companies because Shakespeare is in English and he is out of copyright.This means the works are free.No royalties for the author and no development costs.In addition to the lack of research and development, there is also a guaranteed box office. Shakespeare is always part of the school curriculum. Always. This means audiences will always come because half of them are obligated by the education industry. But while this cultural oppression continues in Australia, our own voice, our own accent, our own narrative is being lost in the shadow of a white English male. It is important to recall what Shakespeare was doing when he was writing. He was an innovator. He was a documenter. He was a contemporary commentator. His works focused on politics and social mores. His works (when they first appeared) often dealt with young people and grappled with complex ideas.His dramas were filled with great comic characters. He wrote good jokes in his tragedies and this is why people liked his plays. This week Geelong After Dark is taking centre stage in our city. It is a festival of music, performance and art that celebrates living in Geelong. There are events and activities in a variety of venues around the city and the programming is specifically designed to act as an invitation to the local people of Geelong to come into the city and celebrate Geelong after dark. This is a great little festival. It is the same sort of thinking that lay behind the programming of Shakespeare at The Globe, 400 years ago. A good night out at the theatre should be like going to the football. We should recognise ourselves on the big stage, we should be hearing our accents and wanting to participate in our stories. This interaction grows a culture. It develops a national library of experience and it helps us to define who we are. A five-year ban on Shakespeare is a great idea for the development of Australian culture. Not for what it is removes, but for what it provokes.And provocation has always been the central task of the dramatist.